I am loving this super simple recipes. They are more challenging than I first thought they would be but oh SO good when they are done right. This one is out of this world awesome. I really think so anyway. My family loved it too. They didn't get to eat as much as I did though because I loved it too much. I "tested" it A LOT. I even ate the leftovers cold while standing at the fridge. I would do it again too! This was a perfect way for me to get my whole family to eat vegetables. Not like they are difficult, really! But I think I could feed this to ANYONE and have them gobble it up! Now you do have to do a bit of prep work to make this nutty parmesan. It's really worth it though. Really really worth it. And you're going to love it so I have doubled the amount that you need for this dish so that you will have extra. That way you won't be sad that you have to make it all over again when you want to put it on EVERYTHING. You can just put it in a little jar and keep it in the fridge for a week or so. Yum! Preheat oven to 300 degrees. Pulse the nuts/seeds, miso, nutritional yeast, lemon juice and salt together in a food processor until crumbly. You don't want it to turn into mush though so just pulse a few times. Bake on a parchment lined baking sheet for 10 minutes. You should stir it after the first 5 minutes to prevent burning. Remove and set aside to let cool. 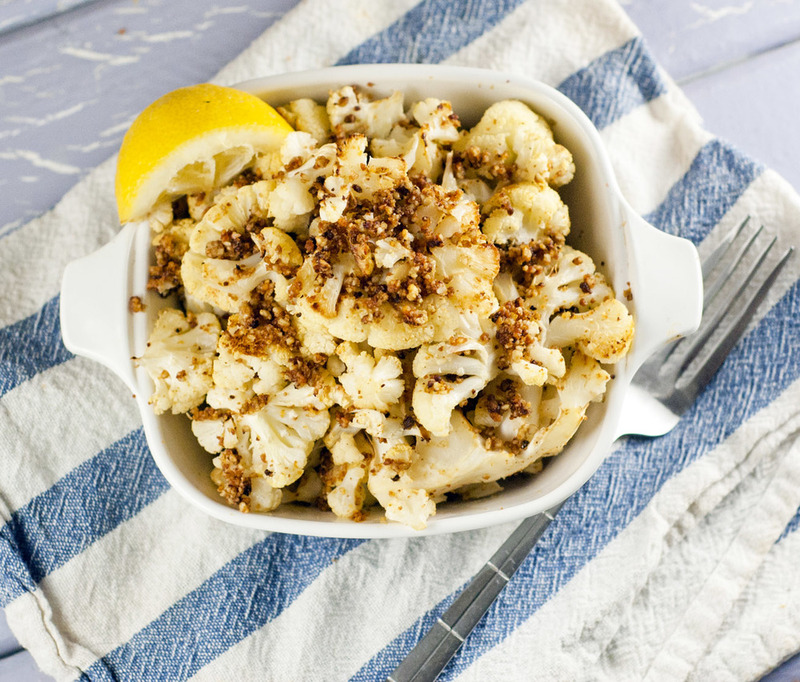 Turn up the oven to 375 degrees for the cauliflower. Make sure your oven is set to 375 degrees. 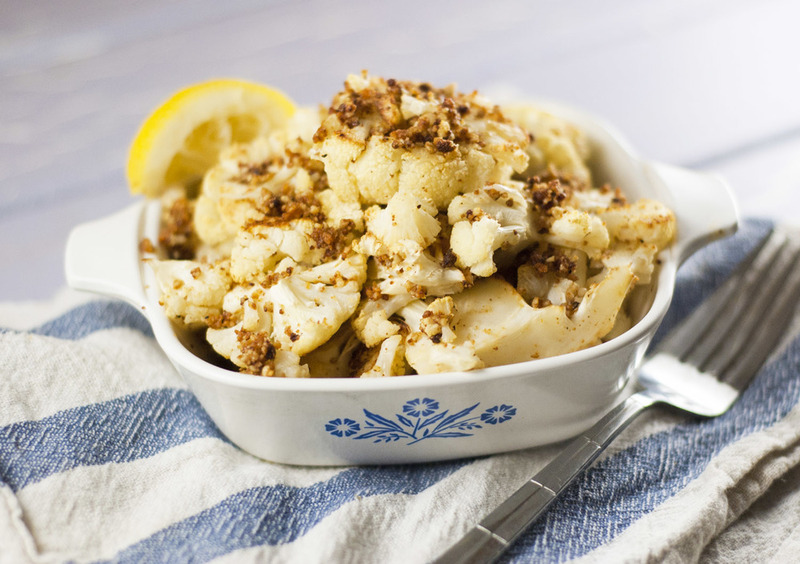 Cook the cauliflower on a parchment lined baking sheet for 35-40 minutes or until tender and browned. Remove from the oven and add salt and pepper to taste. Toss with the lemon juice and 1/2 of the nutty parmesan mixture you made. For a yummy addition you could add in some minced garlic and/or some chopped Italian parsley!